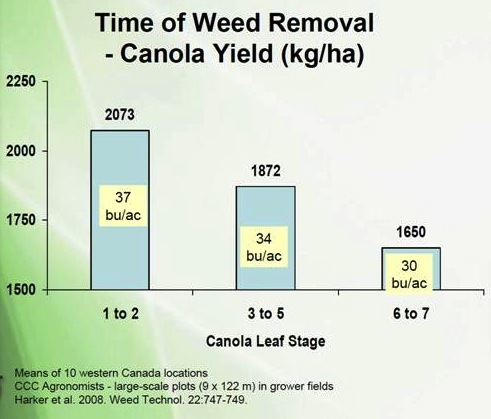 In-crop weed control should occur as early as possible since canola is much more vulnerable to weed competition prior to reaching complete ground cover. Past research has demonstrated an advantage of 3 bu./ac. for controlling weeds at the 1-2 leaf stage of canola versus 3-4 leaf, and a 7 bu./ac. advantage versus 6-7 leaf. At $12 per bushel, that’s $36 to $84 per acre more profit with no added cost. 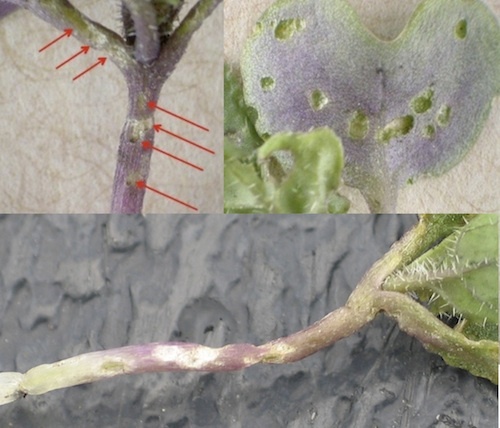 Blackleg lesions are already showing up on some canola fields. 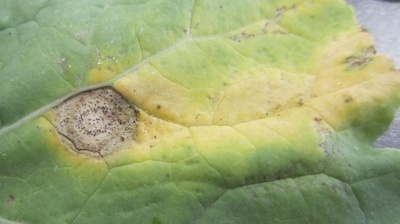 In high risk fields, consider fungicide as an additional tool to limit infection and yield loss. Headline, Propiconazole (Bumper, Pivot, Propel, Tilt) and Quadris are registered for blackleg management in canola. Some cutworm species are already quite active — dingy, for example — and can consume canola plants before they even emerge or shortly thereafter. Dingy cutworms will also eat wheat, barley and peas, so scout all crops. Scout bare or clipped patches, digging around in the border areas between missing plants and healthy plants. That’s where the cutworms will be feeding. Early diamondback moth (DBM) eggs are hatching, and some young canola plants could begin showing “window paning” of the leaves. Spraying for DBM at this stage is rarely needed but it has happened. Consider a spray if between 25% and 33% of the plant material is eaten or damaged, and larvae are still present on the plant. Aster leafhoppers arrive. Are they carrying aster yellows? Aster leafhoppers were spotted in North Dakota, Manitoba and Saskatchewan in significant numbers this week. Leafhoppers can carry aster yellows phytoplasm, but the percentage of the population carrying it tends to be quite low. In extreme cases, growers could spray the leafhoppers, but there is no economic threshold for aster leafhoppers in canola, and trying to time an insecticide so it would be effective and economical may be difficult. Rains can help to mellow soils that had crusted after a couple weeks of dry conditions, but the damage may have already been done. When scouting in fields with poor emergence, dig down and look for the plants — especially in fields known to be crust-prone. For canola fields at or below 4-5 plants per square foot, consider lowering the action thresholds for insect, weed and disease management all season long.